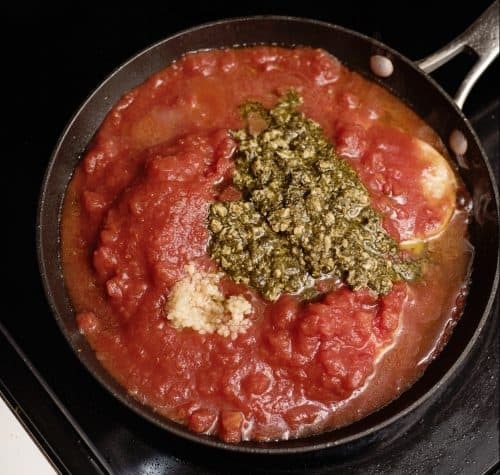 Twenty years ago, when I was a newlywed and had my very own kitchen for the first time, I spent a great deal of time trying out new recipes to find new things that Ricky liked. One of my most successful finds in this area was a little paperback cookbook brochure up at the checkout counter. Just about every recipe I tried became a favorite. I tweaked them a bit to fit our own tastes and then passed them on for Mama to try. When they got rave reviews from both of us, I knew I had a winner. This Pesto Chicken and Pasta is one of those recipes. The original version was a bit more complicated but things tend to get streamlined and simplified in my kitchen, I don’t have time for fussy dishes, and the easy version of this has been a favorite for two decades. Of course, Mama took the time to handwrite all of our favorites into her personal cookbook so they’ve been preserved for the generations to come. She’s good about that. She takes meticulous notes on everything and is never without a notebook and a pen should the need arise. I take lots of notes as well but the difference is that I lose the notes shortly after taking them whereas my mother likely has every note she has ever written in the last five decades – and she knows exactly where they are. She’s the organized one whereas I’m more of a creative mess – or mastermind as I like to think of it. 🙂 I tend to lose things because my brain is always on the next thing I am getting ready to do and often, during the course of my day, my focus is not on the menial task at hand. For example, brushing my hair may begin in front of the bathroom mirror but finish somewhere in the living room because I remembered a book I wanted to get a quote from. As a result, I absentmindedly sit my brush down in my living room chair or on top of an end table rather than putting it back in the bathroom drawer and the next time I need it I have to go through exactly what I was doing when I was brushing my hair in order to find it. My mother, her brush comes out of the bathroom drawer and she stands right over that drawer until she is done and puts it right back in, closing it immediately. These different scenarios are why I end up buying extra brushes and Mama often jokingly brags something to the tune of “I’ve had the same brush since I was x years old because as soon as I am done using my things I put them right back where they go.” I roll my eyes, we each laugh at ourselves and one another and go on about our lives, grateful for the humorous contrast in our personalities. What a blessing to see the opportunities for laughter in your own life and to be able to appreciate the rainbow of personalities around us! Do you and someone close to you have hilariously different personalities? Tell us about it in the comments on this post! This recipe uses items I generally have on hand. Sometimes I have to go buy the Pesto sauce but that is about it. 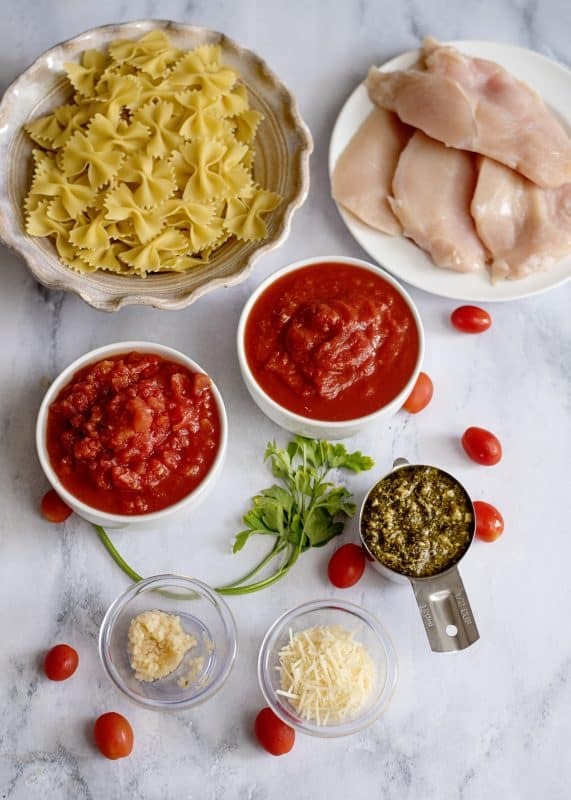 You’ll need: 3-4 boneless skinless chicken breasts or 1.5 pounds chicken tenders, petite diced tomatoes (undrained), crushed tomatoes (undrained), pesto sauce, minced garlic, salt and pepper to taste, and a little olive oil. You’ll also need some pasta of your choice (my daughter loves bowties) and a few tablespoons of parmesan cheese if you’d like, but that is totally optional. 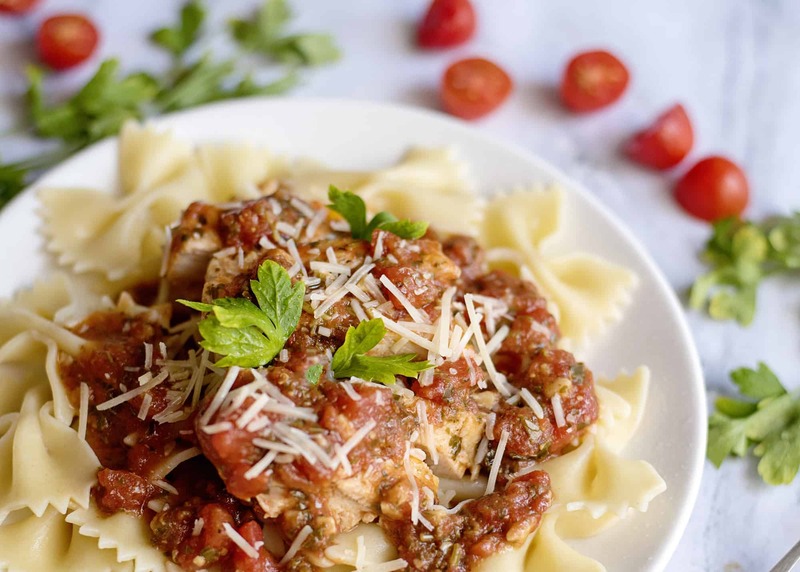 If you’d like to keep this on the lower carb side, just use zero carb pasta or have this dish without any pasta at all, the chicken and sauce are enough on their own to satisfy. On a sidenote: I dearly love Pesto. I usually pick up a jar at Aldi. If you’ve never bought it before it is basically basil, garlic, cheeses, and some olive oil. You can find it near the spaghetti sauce at pretty much any grocery. As far as flavor goes, it packs a delicious punch! Heat a tablespoon or two of olive oil in a large skillet over medium high heat. Add chicken and cook, turning as needed, until browned on both sides. It doesn’t have to be fully cooked at this point. 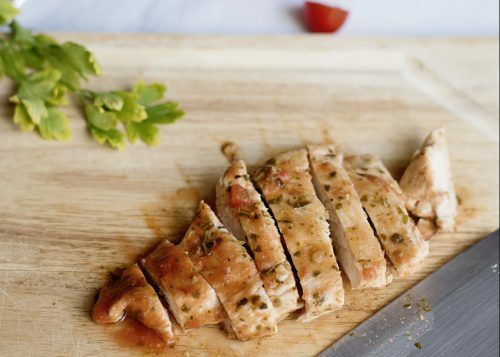 If you used boneless skinless chicken breasts, I like to slice them after I’m done cooking them. The reason being that this makes the serving sizes more balanced for my family. Not everyone eats an entire chicken breast at one meal so slicing it up makes it easier for me to portion out. You don’t have to do this unless you just want to. Return chicken to pan. Add garlic, tomatoes, pesto sauce, salt, and pepper. Reduce heat to medium low and cook until chicken is fully done and no longer pink in the center. Ooh goodness gracious! Look at that delicious sauce covering up all the wonderful chicken! 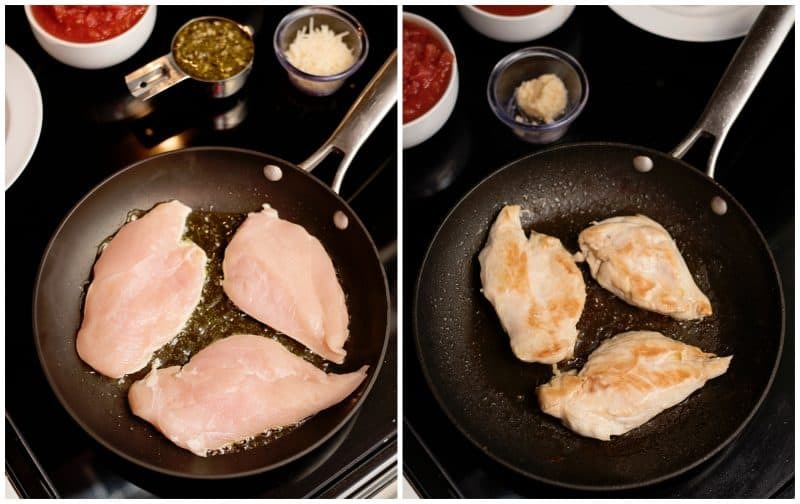 To serve, place chicken breasts or tenderloins over hot fresh cooked pasta and spoon sauce over. Garnish with parmesan. Enjoy your fresh and flavorful family pleasing meal! In large skillet place 1-2 tablespoons of olive oil over medium high heat. Add chicken breasts and cook until browned on both sides, flipping as needed. Chicken does not have to be done in the center. Add both cans of tomatoes with juice, pesto sauce, garlic, and salt and pepper to taste. 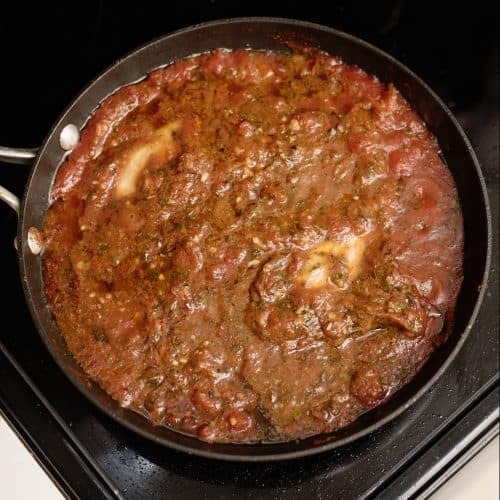 Stir together and reduce heat to medium low, cooking until chicken is no longer pink in the center and sauce is heated through. 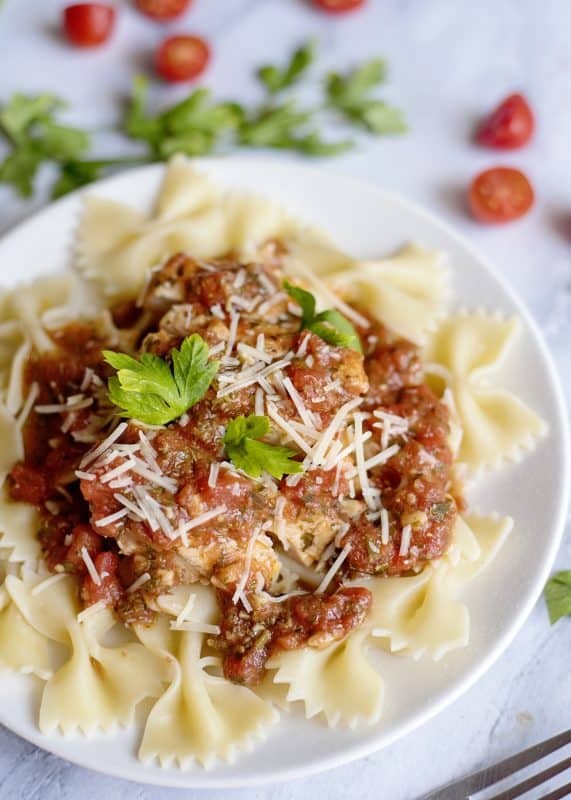 Spoon chicken and sauce over fresh cooked pasta. Garnish with parmesan if you'd like. Enjoy! Next time your tempted to fight fire with fire remember, the fire department uses water. Thanks Christy! 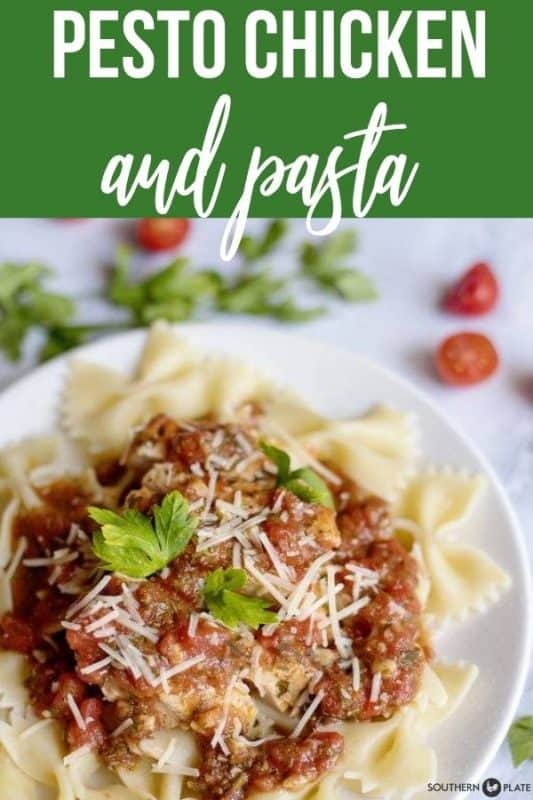 This looks delicious and easy – a great combo in my opinion 🙂 My daughter loves bowtie pasta as well! Thanks Heidi, I hope you enjoy it!!! Oh my goodness, it is Jenny! I really hope you can make it soon!! OMgosh I just have to make this recipe and I think I can work it out so that I can make it single serve as there is only me and I do not have a microwave for reheating, yum yum, thank you Christy from Judi in Australia. Thank you Judi, I hope you get the chance to make it soon!!! This looks wonderful. I will have to give it a try. Thanks! Hey Lou, I really hope you get the chance to try it soon!!! 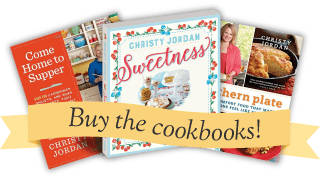 Love your stories that go with your recipes. Question : Is the pesto sauce a particular brand? I’ve never bought pesto but would like to try it. Hey Kim, great question! It’s not a particular brand. I have used several brands and they’re all wonderful 🙂 It comes in little short jars (about a cup size) near the spaghetti sauce. MMmmm, this sounds GREAT! I have a daughter who loves pesto SO much! She calls basil “pesto”. She loves to grow “pesto plants”, haha! 🙂 Love it!! I am in need of some more “Pesto Plants” and think I am going to start calling them that now too!! Tried this recipe tonight for supper and it was delicious! Even hubby liked it and he isn’t big on pasta dishes but enjoyed this one. I plan to share the recipe with others who I know will enjoy it. Thanks for all your recipes. I printed the Sweet Potato Pie with the Streusel Topping to make for Thanksgiving. I may have to try it before then. I love your stories and have told many others about your website. Thanks for all you do. Keep those recipes coming!